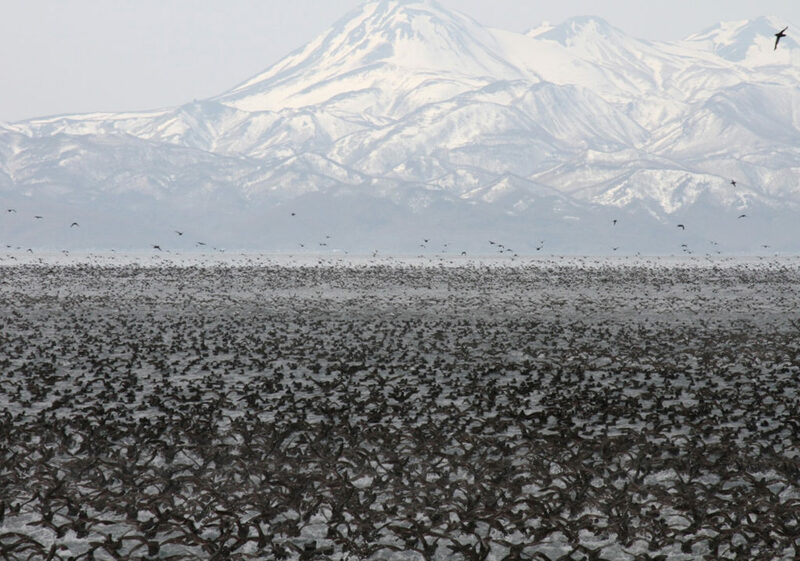 Rausu is rich in nature with an abundance of beautiful seasonal scenery. The sea in this area is home to a wide range of wildlife. I first heard of Rausu in 2005, in a news report about a pod of orcas that got stuck between two pieces of drift ice and died in the waters of Rausu Town on the Shiretoko peninsula. (A model of the skeleton of the largest of the nine orcas can be found in the Rausu Visitor Center.) I never could have guessed that three years later, I would be working in Rausu. I moved here to watch the orcas in Rausu’s waters, and the orcas were the only thing I was thinking of at first, but I discovered that there was much more to Rausu too, and I’ve now been working here for 10 years with no reason to leave. Rausu has long prospered through its fishing industry, and one of the great things about it is that there’s delicious seafood all year round – Alaska Pollock and sea urchin in winter, gillnetted Okhotsk atka mackerel and kelp in summer and fixed-netted salmon and squid in autumn. 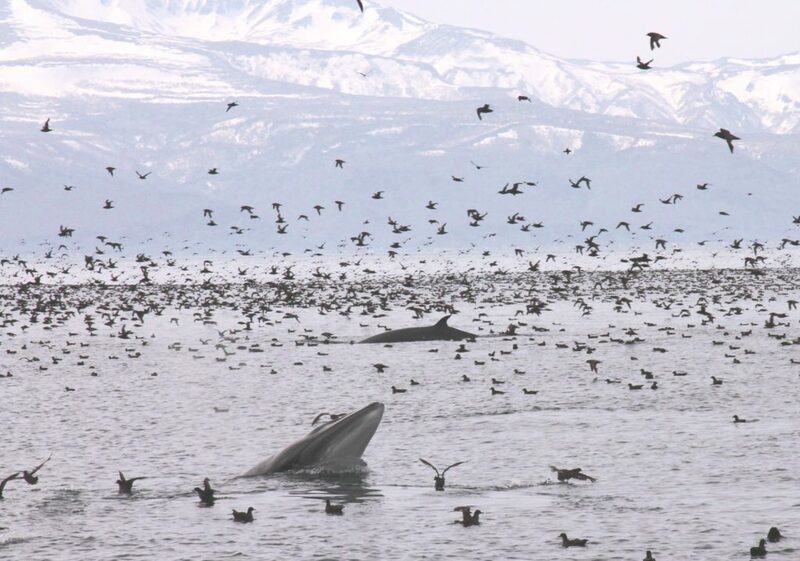 And a sea with so many marine resources attracts all kinds of wildlife into its waters. In addition to enjoying the nature, you can get an up-close look at the fishing industry. 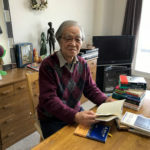 The greatest thing about Rausu is that you can see both the vast natural landscapes of Shiretoko and the lifestyle and culture of the people who live there. After ensuring the safety of my passengers, my biggest job on the ship is spotting wildlife in the sea. The sea changes from one day to the next, and I have to watch it and spot anything that looks wrong. I have to look for wildlife by eye. Sometimes I find some as soon as we’re out on the water, sometimes I have to search far and wide before I spot any. And because I’m working with wild animals, there are of course times when I can’t find any at all. In addition to spotting wildlife, I give the passengers tips on how to spot them and give talks about the wildlife. I also take photos with my camera and post about each day’s cruise on my blog and on Facebook. There are landscapes that you don’t notice when you’re on land and wildlife that you can only see when you’re out at sea. I like to look for them with my customers and watch them spotting them, having fun and getting excited. 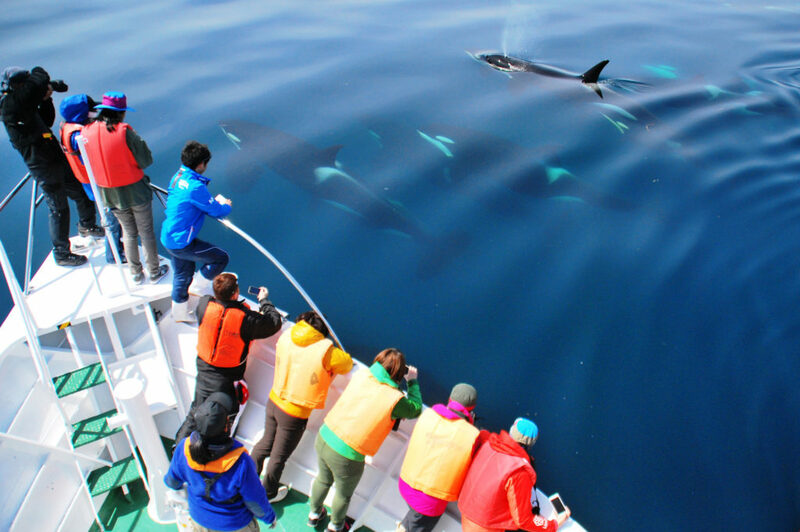 There are cruises around Rausu almost all year round. 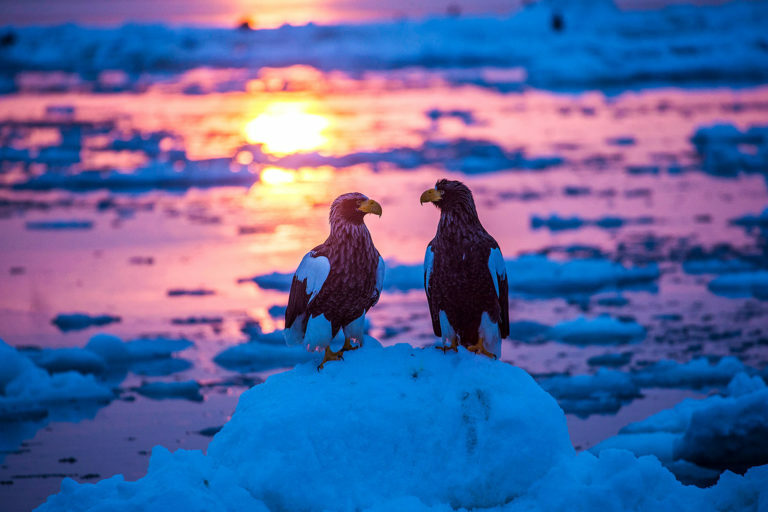 The winter cruises run from late January to mid-March, and you can see drift ice, Steller’s sea eagles and white-tailed eagles. 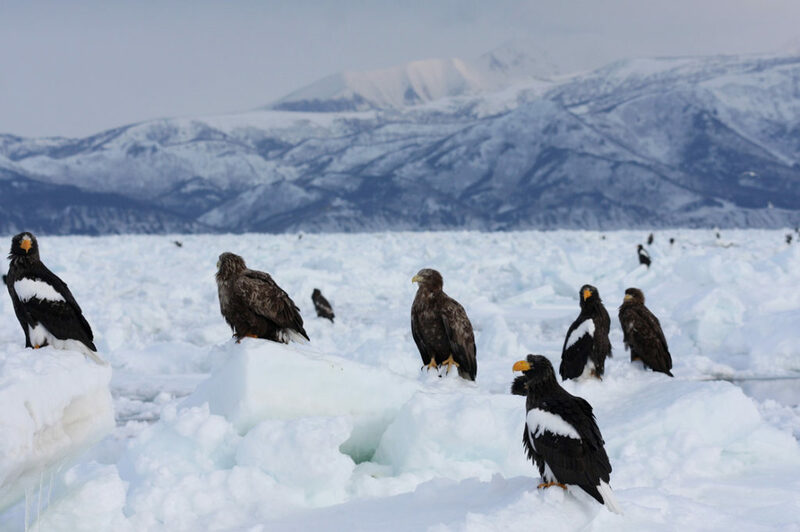 The Steller’s sea eagles and white-tailed eagles that come to Rausu in winter are gigantic birds of prey with a wing span of around 2m. 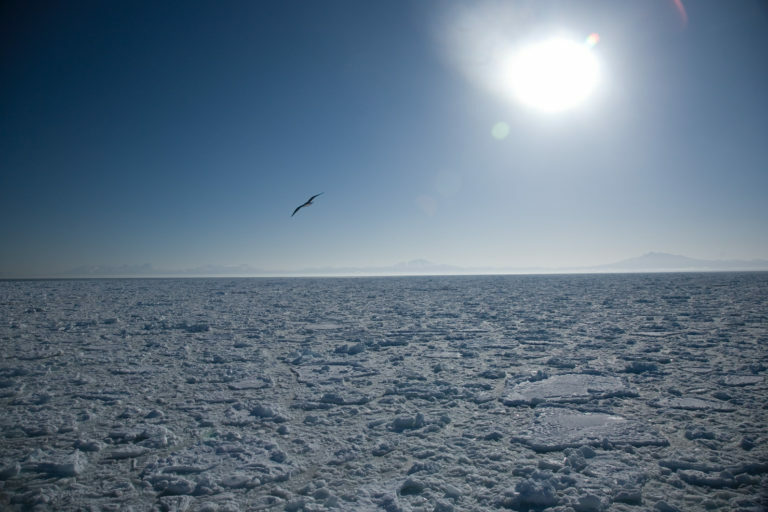 If we’re lucky, we might even see a spotted seal or ribbon seal on the drift ice. 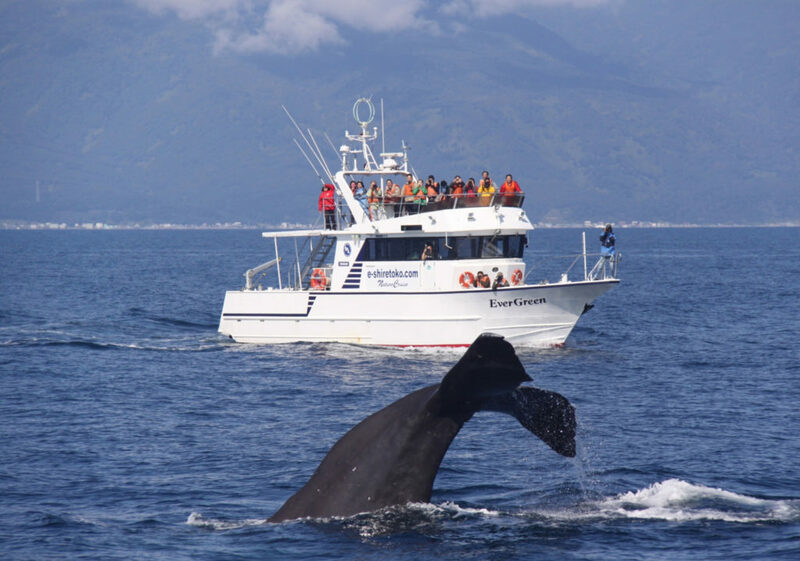 When the summer cruises start in spring, we see lots of orcas and minke whales, and sometimes fin whales and humpback whales come here too. We also get tens of thousands of short-tailed shearwaters which have flown across the equator from Australia. The sea is teeming with them and it’s truly incredible to see! 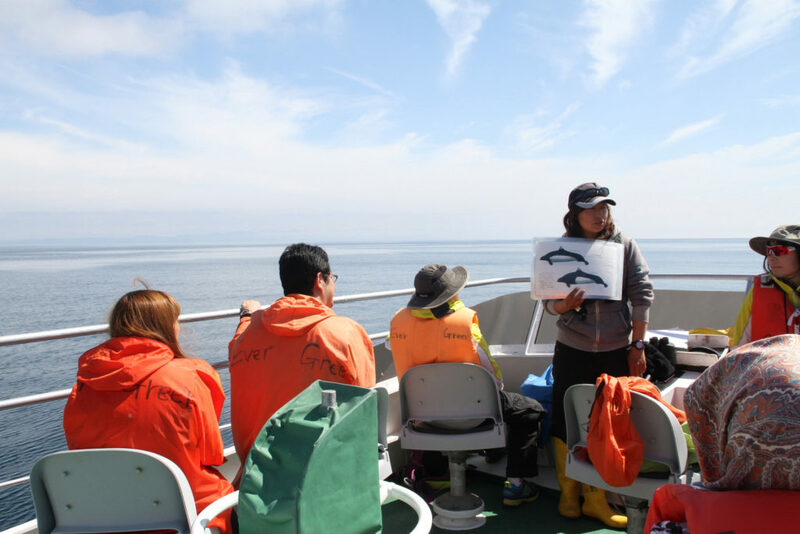 In summer, Dall’s porpoises, Baird’s beaked whales and sperm whales come to the Nemuro Strait. 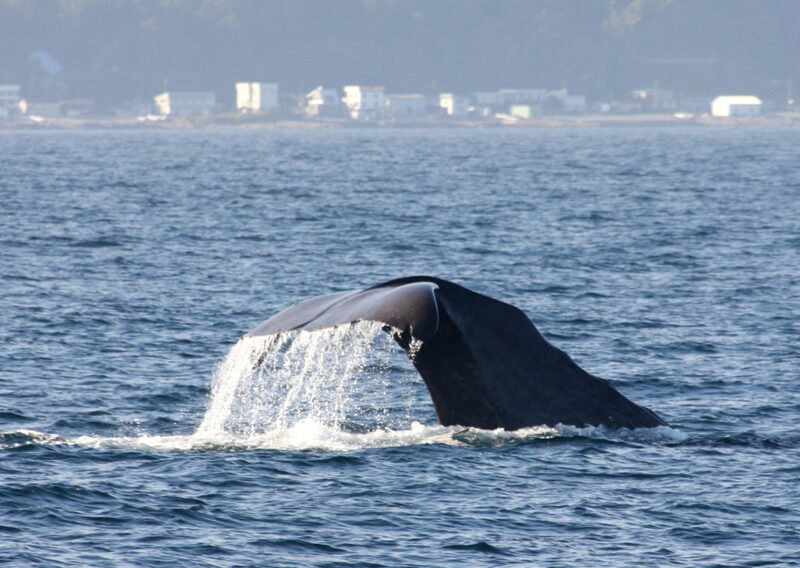 It’s one of the only places in Japan where you can see male sperm whales. They’re over 15m long and when they dive deep under the water, they lift their massive tail fins – it’s amazing to watch! 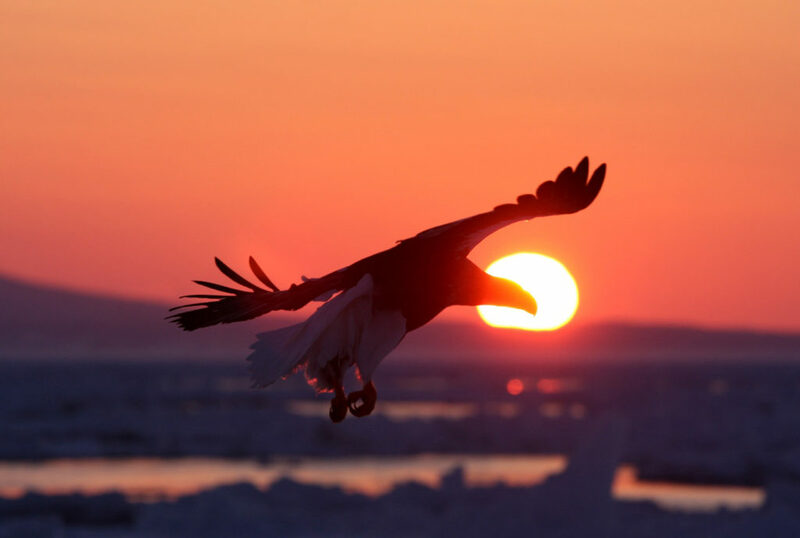 Rausu is the only place in the world where you can see Steller’s sea eagles and white-tailed eagles on drift ice. 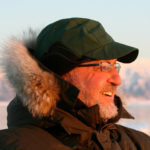 When the freezing winter comes and the drift ice forms, Alaska Pollock come to Rausu and the eagles migrate here to eat some of them. 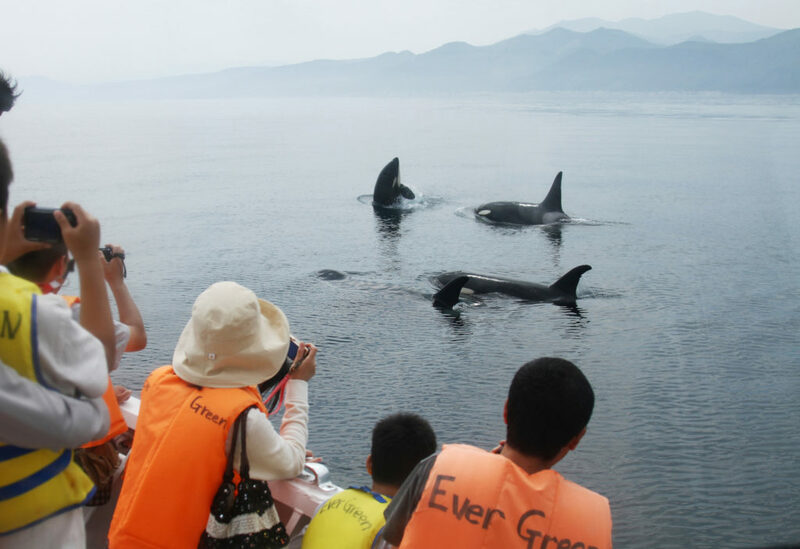 Around 300 orca and 180 sperm whales have been sighted in the Nemuro Strait. 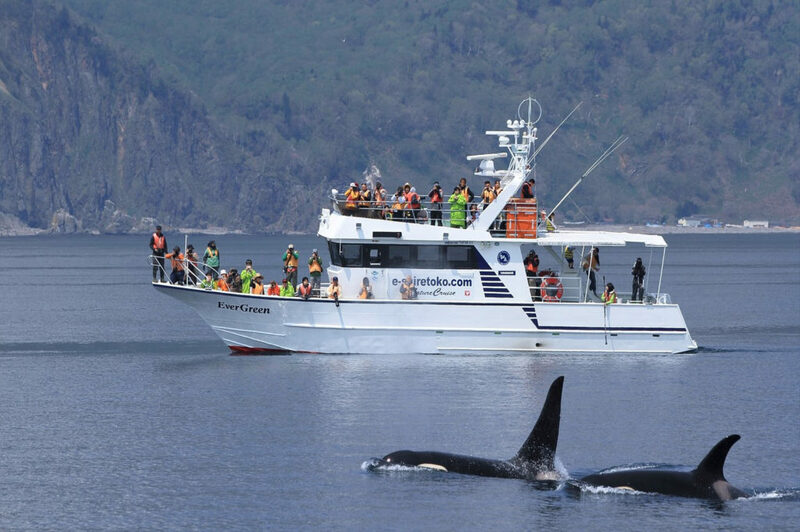 Nowhere in Japan can you see more orcas in the wild than in Rausu. Each year we see our “regulars” and some new orcas. 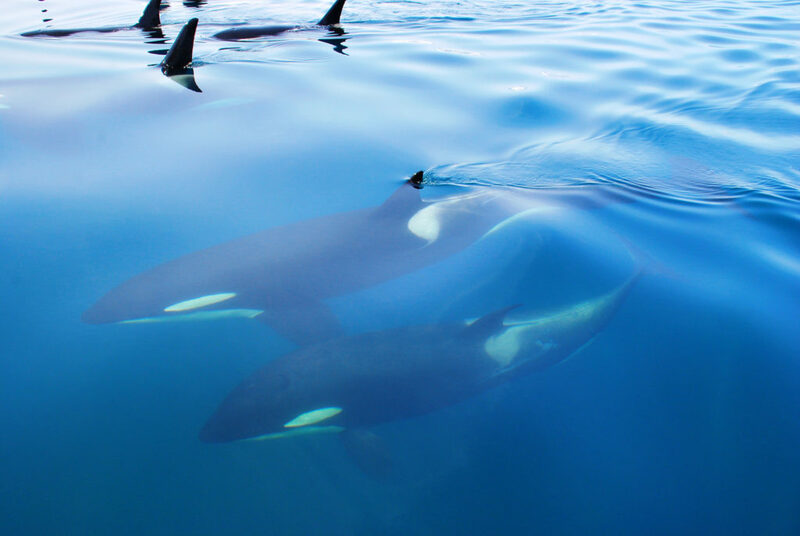 Orcas always move in “families”, and each family has its own personality. I come to recognize particular orcas, and it makes me so happy to see them again each year! As I come to recognize more and more of them, I get more and more attached to them, and I can’t wait to see them each year. You can enjoy cruises almost all year round in Rausu. 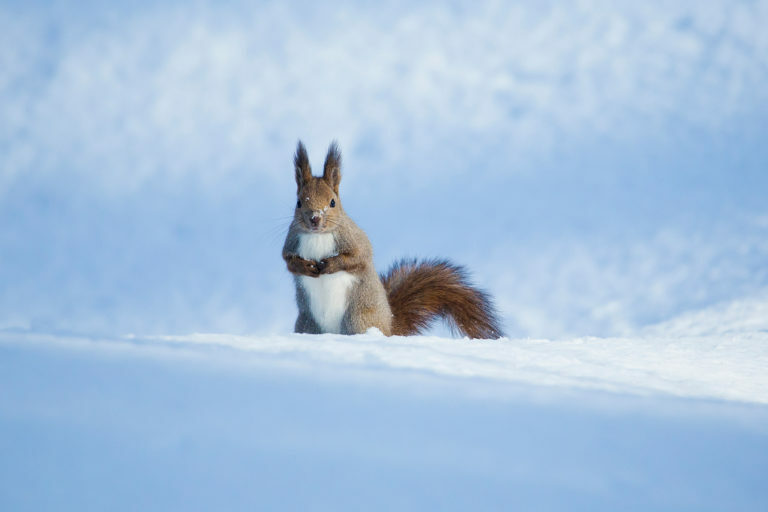 Each season brings new wildlife, and the landscape you can see from the sea changes too! You’ll want to go for a cruise again and again to watch the seasons change. In 2005, the Shiretoko peninsula was designated as a UNESCO World Heritage Site, including the area of sea up to 3km from the shore. 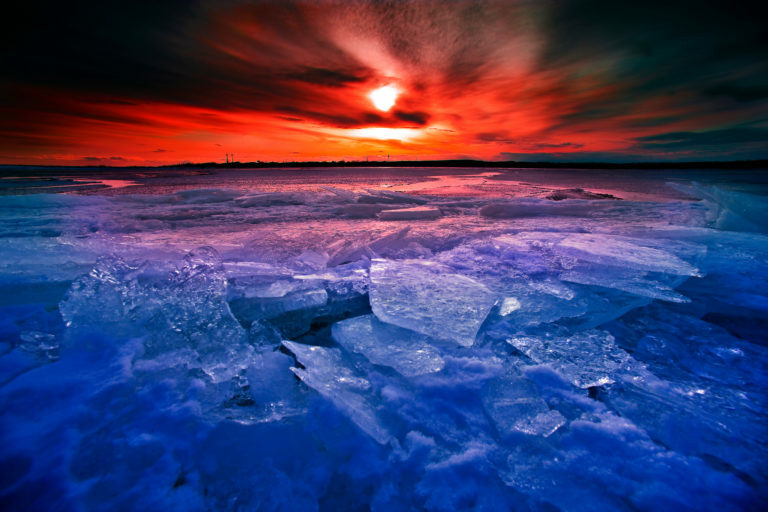 The reason why both the land and the sea were designated is because the ecosystem connects the mountains with the abundant sea, and the drift ice creates a food chain extending from plankton to whales. You can see Kunashir Island in the Kuril Islands just 25km from Rausu. Despite being so narrow, this part of the sea is home to a very diverse range of life. There is one day that stands out most in my 10 years in Rausu, a day I remember like it was yesterday. 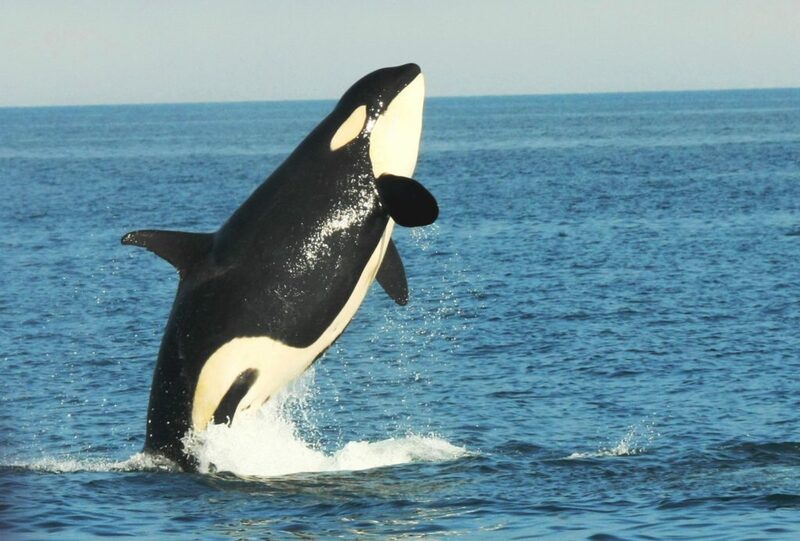 On May 22, 2011, in my fourth year on the job, I saw an orca hunting for the first time. I think that for a lot of people, orcas have a brutal image, but apparently orcas actually have a variety of different eating habits. Some are carnivorous and eat seals and dolphins and whales like you see on TV, some just eat fish, and some eat a mix of both. When I saw that first hunt, it really showed me the fierceness of the natural world and the teamwork that takes place between orcas. Every moment was riveting and awe-inspiring. I was on the morning cruise looking for orcas like usual, and as I watched them, I saw odd activity in one pod. At that time, I couldn’t see what was specifically happening; something just seemed odd. It came time to go back to the port, so on the afternoon cruise I came back to the same point and looked again. That pod of orcas was still lurking around that area. Then suddenly a big Baird’s beaked whale leaped through the middle of the pod of orcas and I finally realized that they had been hunting that whale since the morning. In all of my almost 10 years doing cruises, I’ve only seen orcas hunting a few times. My first time seeing such a rare sight is burned into my memory, and I regret that I was too excited to take a picture of it. I’ve seen orcas hunting several times since then, but it’s something you hardly ever see. It’s a precious moment and you’re lucky if you get to see it! 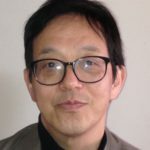 I just moved to Rausu because I liked orcas, and at first I wasn’t really interested in becoming a whale watching guide. I had no experience as a cruise guide, so I’ve had to learn a lot after coming here. I’ve had a daily study routine for this whole time: on every clear morning, I go to Kujira no Mieru Oka (Hill with a View of Whales) Park, a lookout about 5 minutes by car from our office, before work and look at the sea. 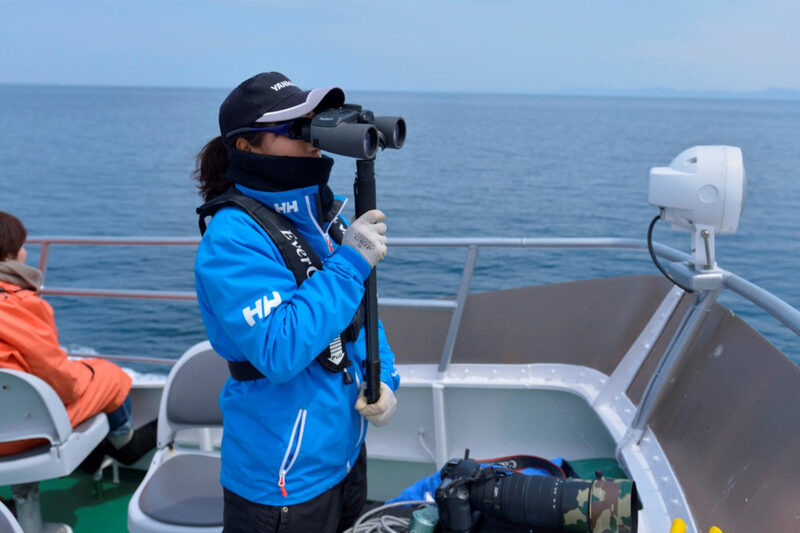 It’s important daily training to develop an eye for what the sea will be like that day, where we’re likely to see wildlife when we go out to sea and any areas of the sea that seem odd. The lookout also has panels with information about the whales you can see in Rausu’s waters and tips about how to spot them. It’s fun to learn from those too and keep those points in mind when I’m observing the sea. I think it’s easier to spot wildlife if you’ve got binoculars. If I manage to spot some while I’m looking at the sea, I go to that spot when we go out on the boat. The topography under the sea in Rausu is quite unusual – about 5 minutes away from the port, the sea suddenly gets much deeper, so you can see sperm whales eating deep sea squid from land. 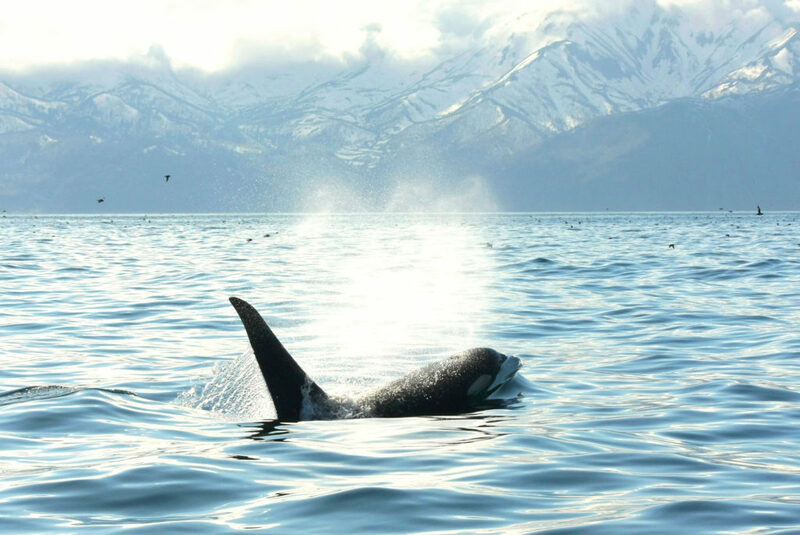 It also means that orcas come closer to land – People here often see orcas from their homes without even needing binoculars. Sometimes when I’m watching the sea, a local will tell me they’ve just seen orcas from their home and I’ll head to that part of the sea when I go out on the boat. These days, even if the cruise gets canceled, I get restless if I haven’t been to look at the sea that day. So I head up to the lookout and have fun watching the whales all by myself. When you’re working with nature, every moment is once-in-a-lifetime – you never see the same thing twice. It’s made me appreciate each moment, and I get to be wowed in new ways every time. Since I have to spot wildlife with just my own eyes, I often have passengers asking me if I feel pressured. I don’t! I just want to do what I can to make the cruise more fun for my passengers. At first I took this job just to work with orcas, but now I really want as many people as possible to know how amazing Rausu is. And the most fulfilling thing about this job is the countless encounters with wildlife and the way I can share those incredible moments with my passengers. 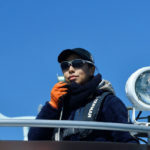 And it’s a personal joy for me too – just being able to go out to sea every day is the greatest joy for me, and being able to enjoy that with my passengers makes me really happy. What started as a way to do what I enjoyed and have fun has become something where I want to make my passengers happy and make the experience fun for them. Rausu has a truly amazing sea, and someday I want to take a personal trip out there. Every day I get to see these wonderful sights from the boat, and as much as they can become “normal” for me, “normal” on Rausu’s sea is a special place with sights that thrill a lot of people. I hope to show as many people as possible how beautiful these sights are. I moved to Rausu, Shiretoko because I love orcas. 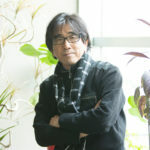 As a sightseeing cruise guide, I spend my days learning all about Rausu’s nature, and it thrills me every day. A lookout with a wooden deck near Rausu’s lighthouse, where you can see dolphins and whales in the wild. There are also panels with information on the whales. A facility that provides information on the area’s land and sea for visitors to Shiretoko. It has Japan’s largest model of an orca skeleton and a big screen showing scenes of each season in Shiretoko. 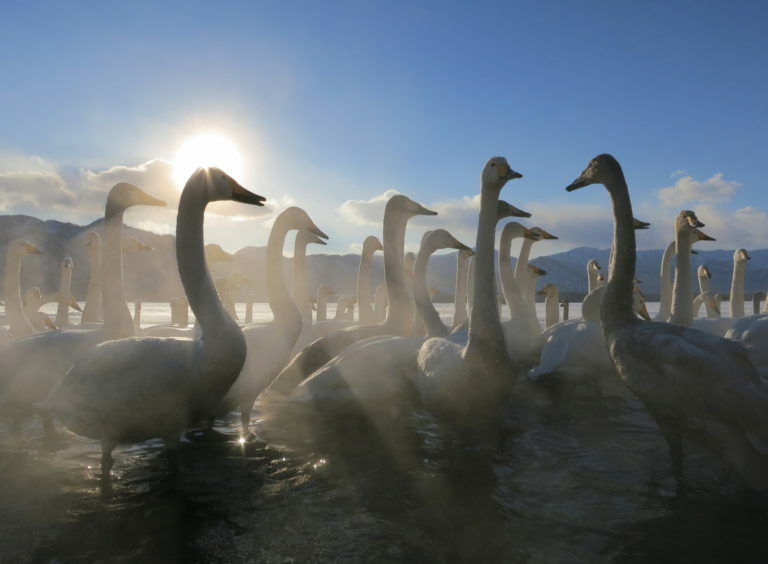 Each year the Whooper Swans, the Angels of Winter, arrive into Hokkaido to spend the coldest months of the year.